The LNWR Society is making the comprehensive book on LNWR Non-Corridor Carriages available at a special offer price of £15.00, including UK postage, (cover price £29.95). With 136 case-bound A4 pages printed on high quality gloss paper, it is produced to the usual high standard of LNWR Society's publications. 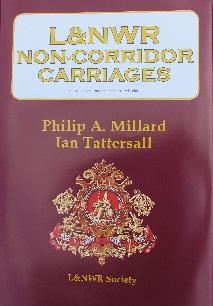 This well-researched and definitive book combines Philip A. Millard's exceptional knowledge of LNWR carriage stock with a magnificent set of 4mm scale drawings of well over 120 types of carriages. The specially prepared drawings by Ian Tattersall are accompanied by numerous b&w photographs showing examples of LNWR carriages in their original livery as well as in LMS colours. The carriage types dealt with are non-corridor designs built at Wolverton from 1886 to 1923 (with the exception of the 30ft 1in six-wheel types which are dealt with in depth in a separate LNWR Society Portfolio). Many of these carriages lasted well into LMS days, while some made it into BR ownership. As well as information about their construction this book includes a wealth of information about set formations and carriage workings and provides an insight into everyday railway travel at the time. It is of enormous value to everyone with an interest in passenger train working in the early twentieth century. With kits available from a number of suppliers in various scales, especially 4mm and 7mm, this book enables the modeller to create accurate and well detailed models of carriages from the Premier Line's Wolverton workshops. For mail order information please email the Distribution Officer.